Well, this is a rarity. I honestly can’t remember the last time I re-read a book. Granted, this was a graphic novel, which is generally a quick read anyhow, but usually my cup overfloweth with new reads leaving me with little interest in re-reading stuff. 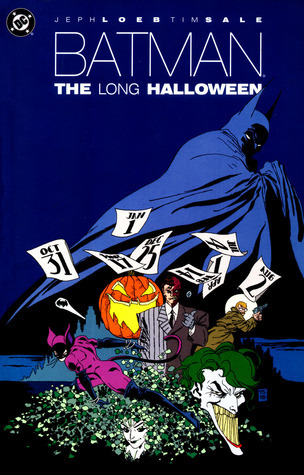 Back in August when I was scheduling my reads for October (a.k.a spooky book month), I was perusing my shelf for some frightening fiction when I came across Batman: The Long Halloween. Given that I haven’t read this one in about eleven years, I figured it was time to revisit my (at the time) favorite Batman story. Over the course of one year, beginning on Halloween night, the story follows a new serial killer in Gotham dubbed “Holiday”. He or she has been murdering those connected to the Falcone crime family and true to his or her name, is doing so only on holidays. Batman, District Attorney Harvey Dent and Police Commissioner James Gordon form a trio with the goal of catching the crazed killer. After the urging of editor Archie Goodwin, Loeb and Sale picked up where Frank Miller left off with Batman: Year One telling the origin story of one of Batman’s most infamous adversaries, Two-Face. The story of Harvey Dent will always be a tragic one and while I ultimately prefer Christopher Nolan’s version within the 2008 film The Dark Knight, it is clear Nolan borrowed heavily from this story (there are even panels that could be storyboards for the movie). I really love this story. The art is gorgeous given its dark and moody presentation and the writing is some of the best I’ve seen in my experience reading The Caped Crusader. It’s good to know that nearly eleven years after I first read the book, it still holds up as my favorite Batman story. There were rumblings that in 2019, we could see the release of the long-awaited animated adaptation, but it doesn’t look like it’s on the table for next year. Here’s hoping we get it soon (then again, you could just watch The Dark Knight). DC may not get the live-action films right, but they rarely go wrong when it comes to the animated division.